Walking into a room of Impressionist paintings always feels like coming home; there is a calm to the predictably pleasant. It takes a bold and innovative approach to snap one out of this complacency, and Peabody Essex Museum’s new exhibit, “Impressionists On The Water,” is that and more. With over 90 paintings, prints, model boats and photographs, the exhibition focuses its lens on the influence waterways had on French Impressionists Monet, Renoir, Matisse, Signac, Pissarro, Caillebotte and Daubigny. The unconventional staging of the show is masterful. Each display is punctuated with models of the boats illustrated in the nearby paintings. Of the two full-sized boats, the replica of the craft in Caillebotte’s “Boating on the Yerres” is a work of art in its own right. The curators have overlooked no detail: even the gallery walls are treated with sculptural elements that evoke a watercraft. France’s many rivers and ocean harbors inspired its national pastime of pleasure boating. Among the most passionate sailors and yachtsmen were our beloved painters, and each has a maritime story to share. 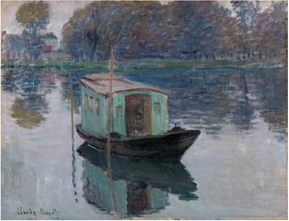 Caillebotte designed and created more than 20 boats; a racing rule bears his name. Signac owned 30 boats. Daubigny and his protege, Monet, lived on studio boats so they could be closer to their subject matter. Throughout the exhibit we sense a celebration of light, water and sky. These painters brought the hallmarks of the Impressionist movement to their water experiences: spontaneity, sunlight, exhilarating color and a devotion to painting outdoors. They painted what they saw and felt; there is passion in their palettes. Among the harbors, regattas, beaches and waves, one painting really stands out. Eugene Delatre’s “Woman Rowing” is a watercolor of a solitary woman in shadow, rowing towards sunrise. She is the lone female of the show and the lone loner; every other boating painting depicts at least two men. The most unexpected and wonderful surprise of the exhibit, however, is the lifesized reproduction of the floating boat Monet painted in the adjacent “Monet’s Studio-boat.” We are encouraged to enter and take a seat. The boat is outfitted with every appliance and comfort, and video displays mimic a water-line perspective. Like Alice and her rabbit hole, we have stepped into another world. By the time we reach Monet’s “Waves Breaking,” the last painting in the show, we are looking through eyes that have gained a fundamental understanding of the artistic possibilities inherent in water and boats. We linger a bit before leaving, seeing what Monet saw, breathing the salt air and celebrating a single moment of just standing by the sea. Maurice Prendergast (1858-1924) and his jubilant style seduced me at the Barnes Museum in 1999. A snobby Francophile, I was ill-prepared to lose my heart to an American Post-Impressionist artist in that quirky bastion of French Impressionist masters. But lose it I did. For the last 14 years, I have wondered why Prendergast was not more widely exhibited. Bowdoin College Museum of Art’s stunning “Maurice Prendergast: By the Sea,” on exhibit until October 13, 2013, makes up for lost time. Prendergast was born in St. John’s, Newfoundland, to a shopkeeper who moved the family to Boston in 1868. He studied painting in Paris and spent summers in France honing his skills and establishing his lifelong artistic niche of representing seascapes and the crowds that flocked to them. He returned to Boston in 1894 where he worked as a commercial artist. He spent many hours at Boston’s piers, chronicling the men, women and children who idled by the water. By 1900 he had his first solo show in New York. He was continuously lauded and exhibited until his death in 1924. A lifelong bachelor, his frail health left him deaf at an early age. His brother Charles, a gifted craftsman whose frames house many of the works on display, was his constant companion and supporter. The enchanting show (and its equally wonderful catalog) gathers, for the first time, a retrospective of Prendergast’s seaside imageries of New England, Italy and France. The 88 oils, watercolors, pastels, sketches and monotypes celebrate the artist’s decades-long love affair with all things “seaside.” These are not just pictures of pretty scenery. Each is alive with crowds of happy people enjoying the sea. The thickly applied vibrant color of his oils, and masterful fluid transparencies of his watercolors, establish Prendergast as an imaginative authority of his craft. Strolling from room to room, one is aware of the influences of Sargent, Cezanne, Renoir and Bonnard. And yet, with that awareness comes an appreciation for this artist’s unique and innovative contribution to the evolution of the genre. His oil paintings vibrate with sumptuous color. His playful watercolors emit a peacefulness and deep admiration for both landscape and those enjoying it. The obvious joy his animated well-dressed subjects take in their surroundings is contagious. Adding to this exhilarating mix is the unexpected surprise of recognizing our own backyard in many of the paintings’ titles (Marblehead, Nahant, Revere Beach, Salem). The oil, “Marblehead Harbor,” on loan from the Barnes Foundation, is a particular thrill. I dare you to go to this delightful show and not fall in love. In fact, I double dare you.